A beautiful haven that sparkles with an old world charm and transports you into the renaissance period. You can walk in and feel the magic and warmth of this divine locale. The old manor farm and its intimate connection with the close surrounding land is a rare beauty. Daniela, the owner, tells us. “It immediately seems to be unique to find an old manor farm in the core of the village, close to the central square”. Patù is sea-front village with emerald waters, and monumental olive groves. 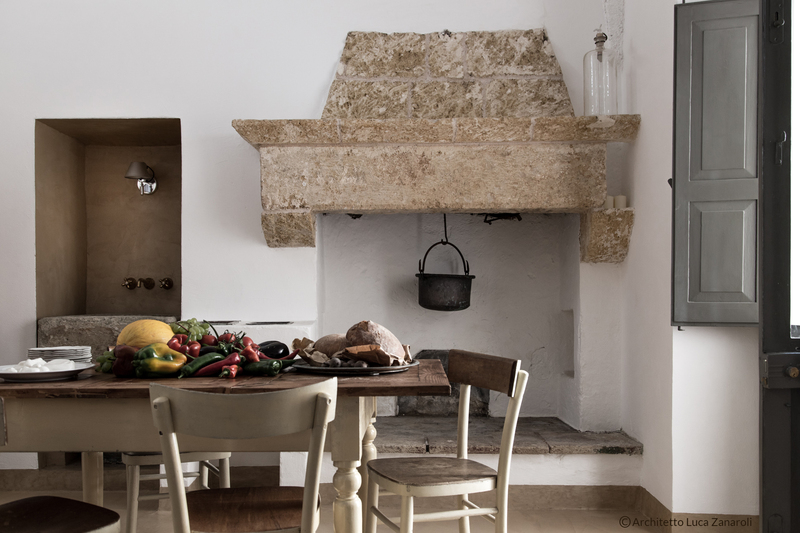 “Patù in court” are two apartments built in an old olive mill. The square is populated by people who like sitting at “Rua de li Travaji’s” outside tables during the evenings, where Gino has been cooking delicacies he learnt from the local women. While it is also not so rare to find some girls doing the typical dance called “La Pizzica” played with little drums and guitar. “Patù caput mundi in the Salento's nights” says mockingly Gianfranco. But then all you have to do is cross the threshold to remain alone with the stars, with your dreams which seem to come true. The edifice has got rib vaults; The walls are built with mortar and tuff stones. There are small windows and the typical maiolica cover and frame the floors of the two apartments. Away from prying eyes, they let you enjoy Salento, their fragrances, and their essential strength.